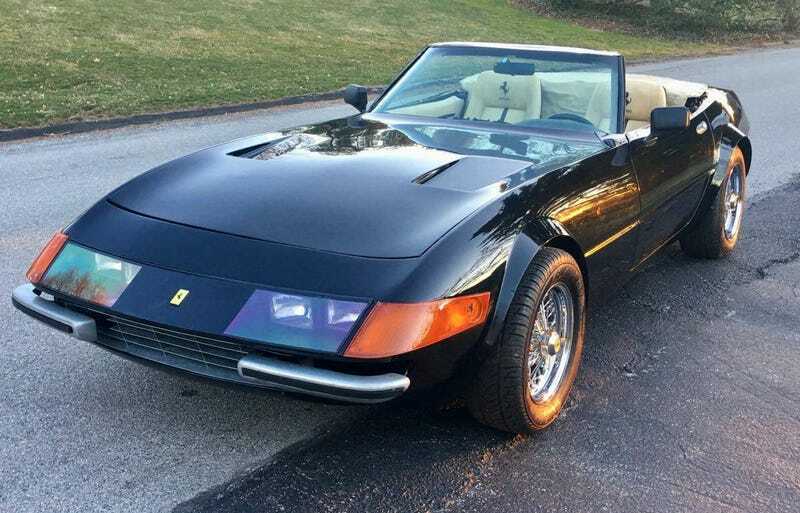 At $23,999, Could This 1976 McBurnie Ferrari Daytona Let You Fake It ’Til You Make It? The seller of today’s Nice Price or Crack Pipe ‘undercover corvette’ starts off the ad announcing that he’s dropped its price by more than five grand. He says that’s firm, and unlike the car, he’s not faking. To be honest with you, ‘Challenger Hellcat’ sounds to me like the Billboard listing for the latest Judas Priest chart climber. I’ll let you come up with your own lyrics for that one. We came up with the automotive equivalent of a JP screamer—a 2015 Dodge Challenger SRT Hellcat—and yesterday we put its $44,000 price tag to the test. The seller of that green meanie claimed it to be the cheapest in the nation, and with a 62-percent Nice Price vote, the majority of you sure thought it was cheap enough. Yes, it did have a lien against it from a local credit union, but that’s not our problem as it’s unlikely any of us would actually drop a wallet on it. We’re all about the hypothetical here. Speaking of hypothetical, that’s the sort of, kinda, could be construed as description of this Ferrari 365 GTB/4, a car we’ve all come to know and love as the Daytona. It’s hypothetical because, aside from the badging, turn signals and tail lights, there’s little even remotely Ferrari about this car. That’s because this is one of the infamous ‘McBurnie’ cars, a Daytona spider replica splashed in fiberglass from the real deal, and then massaged onto a C3 Corvette chassis. Tom McBurnie gained notoriety in the ‘80s for the Faux-Ferrari after a car similar to this one appeared as a prop piece on the TV show Miami Vice. Ferrari sued McBurnie for trademark infringement over the proprietary design of the Daytona’s body, and in a landmark case concerning the extension of ownership of un-copyrighted intellectual property, the courts decided in favor of the plaintiff. McBurnie had by then built about 80 Daytona knockoffs and while a few more were in the queue, an arson fire at the shop turn a lot of the in-limbo product into carbonizzato crackers. This car escaped the factory before both lawsuit and arson, and is described by its seller as the ‘UNDERCOVER CORVETTE’ for its 1976 C3 underoos. That’s an appropriate term since you’re unlikely to puzzle the platform’s origins from just the windshield shape and A-pillars. You’re not likely to mistake it for a real Daytona either as there are a lot of funky elements on the McBurnie cars, not least of which is a four-inch stretch in the body to accommodate the C3’s longer wheelbase (94” vs. 98”). Other oddities include rectangular sealed beams under the plexi covers, Dayton wires where Borranis should sit, and an interior that’s a weird mix of Ferrari-esque styling and Corvette seats. The ad says those seats are upholstered in custom Connolly leather. The carpet beneath the seats is claimed new, and the steering column comes from the hot rod catalog. There’s no A/C, and honestly it’s difficult to tell if there’s even any way to get heat out of the three center-mounted dash vents. The bodywork does look like a Daytona, but pop the hood and the charade is over. There you’ll find Chevy’s ubiquitous small block, an engine that seems to turns up like a bad penny in almost every special. The mill here looks tidy and everything seems to wear a reasonably fresh coat of black paint. Holley-branded valve covers ad some bling but otherwise everything appears to be pretty stock. Behind that lives a three-speed automatic transmission, ‘cause Crocket can’t shift gears and hike up the sleeves of his linen jacket at the same time. The top looks to be in decent shape with a clear plastic rear window and reasonable fit when erected. Paint shines as you would want. That stands in stark contrast to the bumperettes which are dull as dishwater. Are they even metal? Or, are they silver-painted fiberglass? Hmmm, that’s going to bother me now. You on the other hand, can’t be bothered. You need to get your vote on and decide if this McBurnie is worth the $23,999 now being asked by its seller. He was asking $28K but apparently that didn’t fly. Just as a point of reference, real Daytona Spiders regularly go for two to three million. This one’s a lot less, but it’s also a lot less car. Do you think it’s enough however to command that $23,999 asking? Vermont Craigslist, or go here if the ad disappears. H/T to Mike D. for the hookup! At $44,000, Could This 2015 Dodge Challenger SRT Hellcat Be Near Purr-fect?